December is always the most exciting month on the calendar with regards to box office. With so many North Americans flush with vacation-related free time, all of the holiday shopping in the world cannot stand in the way of big business at the local cineplex. Even better, this is the time of year where quality matters the most. If a project starts winning end-of-year awards and creates Oscar buzz, its potential movie-going audience will expand exponentially. Million Dollar Baby, Sideways and Brokeback Mountain never looked like box office factors, yet somehow the trio of films wound up with roughly $85 million in domestic receipts. Considering that their average opening weekend was $311,000, this is an impressive feat, even for platformers. That's even truer when we factor in that the average budget for the three releases was $20 million. Stating the obvious, awards contention can make or break many of the under-the-radar titles released this month. Keeping that in mind, here are my thoughts on which movies are box office heavyweights. 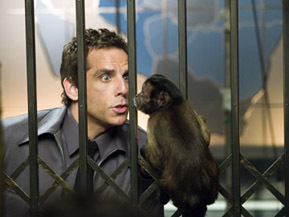 Ben Stiller is a deft comedian. He has proven himself capable of either playing the over-the-top villain (Dodgeball), the action movie stereotype (Starsky & Hutch), the idiot savant (Zoolander) and the straight man extraordinaire (There's Something About Mary). No matter what you think of his movies (and there have been about five which I would classify as unforgivably awful), you cannot argue with his track record for success. And even allowing for this, Night at the Museum appears to be (at least on paper) the most shamelessly commercial project he has done thus far. The special effects-laden comedy is one I expect to be his Jumanji. It won't match the $279 million Meet the Fockers pulled in, but Mary's $176 million is in the realm of possibility. In a deep month, that total should be more than enough to win. Here it is. This is the feast or famine prediction for December. I suspect that if we took a dozen of the box office geniuses at BOP (use the words ironically is so inclined) and placed them in a room, we would see half a dozen say blockbuster and the rest say huge bomb. The only surprise would be someone arguing for a middle-of-the-road performance. Lines are divided here as even the most neutral of analysts feels a need to either praise Gibson for his maverick directorial successes or damn him for his personal failings.